My car only got to -9 on my way to work this morning (it takes a while for the car to realize that it's colder than the garage -- even though all liquids in my garage are frozen now!). But the weather service a la Yahoo says it's -14 right now. 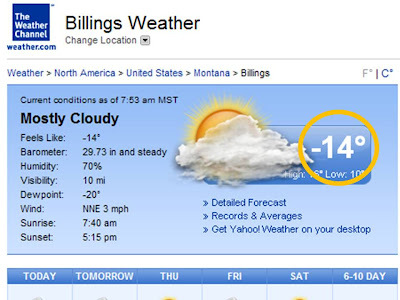 For those of you not familiar with what -14 feels like, that's reallyreally cold. Melodee, do you have your long johns on? I sure do! come, buy and eat! Come, buy wine and milk without money and without cost. Now it's your turn. Would you leave a verse in the comments that speaks to YOU about finding your satisfaction in Christ? Psalm 63 was my first thought. Delight yourself in the Lord and He will give you the desires of your heart... Psalm 37:4 or as Piper words it - God is most glorified in us when we are most satisfied in Him! Wait for the Lord. Be strong and take heart and wait for the Lord.